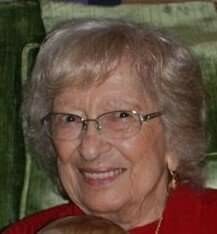 Mary J. Lagasse, age 97, died August 29, 2018 at Legacy House, Ocala, FL. Mary was born March 19, 1921 in Johnston, RI to the late Domenic and Santa (Don Francesco) Vendetti. She was preceded in death by her husband of 36 years, Thomas P. Paolino, her daughter in law, Sharyn Paolino, her daughter, Joan S. Paolino and her grandson, Thomas J. Paolino, Jr.
Mary lived her life to the fullest, learning to play golf at the young age of 73. She was deeply devoted to her family and to her God. She always had time for a smile or a story. She will be deeply missed by all who knew her, and her many words of wisdom will be with us all forever. Mary was involved in many organizations over the years. Whether school, church or social organization, she was always willing to serve and give back to others. Her children will always remember the pounds and pounds of homemade fudge she made for St. Matthew’s Bazaar in Cranston, RI during their school years and her years as a Camp Fire Girl Leader. Mary never met a stranger and there was always room for “one more” at her dinner table. Mary is survived by her husband of 22 years, Edgar L. Lagasse, her children, Thomas J. Paolino, Sr., Linda Dauphinais and her husband Art, Jean Moore and her husband Mike and Cheryl Hardin and her husband Rich. Step-children, Paul Lagasse (Gloria), Henri Lagasse (Deb), Donald Lagasse and friend Laurie Kawski, Anne Morelli (Bob), Cathy Berlo (Paul), Joan Belanger and friend Jay Dyer. She is also survived by several grandchildren and great-grandchildren. Mary’s family will receive friends from 1-2 PM on Sunday, September 2, 2018, at Roberts Funeral Home, 19939 E Pennsylvania Ave, Dunnellon, with Funeral Services to be held at 2 PM. Mary will be buried at a later date in the Jacksonville National Cemetery, Jacksonville, Florida. Flowers welcomed or donations made in her memory to Legacy House, Ocala, FL.